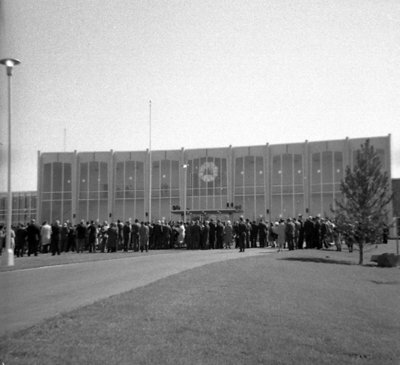 A black and white photograph of the crowd before the opening of the new Ontario County Courthouse and Administrative Building. The Ontario County Courthouse and Administrative Building was built in 1963-64, and demolished in September, 2010. Ontario County Warden J. Sherman Scott and Oshawa Mayor Lyman A. Gifford laid the corner stone on November 28, 1963 and the building was opened on September 30, 1964 by Ontario Premier John P. Robarts. 605 Rossland Road East, September 30, 1964, Brian Winter. Whitby Archives A2013_004_120.